Marc O’Reilly releases his new album today. L’Être Politique is Marc’s fourth album and his second album in two years. The album is about his view on the politics of the human interaction and is inspired by big names like Queens of The Stone Age and Pink Floyd. Last month Marc O’Reilly released the single Dollar to give us a preview of what the album is about. On the song he talks about Trump & Co, political elitism and empty promises to help the working man and woman who are left behind as the rich get richer. 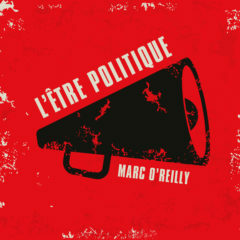 This sets the tone for the rest of the album, which contains heavy rock songs with O’Reilly’s characteristic voice and rhythmic guitar play, L’Être Politique means political policy and is about everything that’s wrong with this. Want to here the new songs live? Next month Marc will be in The Netherlands to play at the Life I Live festival in the Hague (April 26th).